Our continuing series Comic Questions is asking the questions that comic book fans don't often ask. We'll be looking at some of the gaping flaws in logic in some of the most beloved figures and concepts in comic books. This week, we address the burning question of Spider-Man's famous wall-crawling ability. How does Spider-Man stick to walls? Especially with gloves and shoes on? First of all, let's look at how real spiders stick to walls. Recently, scientists have come to understand that spiders use something called Van der Waals force, an electrostatic force that attracts all surfaces on a molecular level. Spiders have tiny hairs on their feet, and each hair causes a slight bond to a surface that's not much on its own. However, the thousands of hairs multiply that force until it can support the spider's weight. The assumption with Spider-Man has always been that this ability somehow transferred to him with the spider-bite. The movie used this explanation, showing long hairs coming out of his fingertips. That's a nice idea, but it doesn't work. In real life, technical problems are plaguing scientists trying to duplicate the effect. Specifically, they've found that this works on tiny spiders, but the force is difficult to scale up to support a full-grown man. Even if it was, the force would be so strong that it would be hard for Spider-Man to peel off. It also doesn't address the problem of his shoes - are the hairs long enough to work through the soles? Since the true understanding of wall-crawling was a mystery up until a few years ago, the comics had to come up with other explanations for Spider-Man's power. At various points, the explanation changed to static electricity. This became a plot point, because the supervillain Electro was able to absorb static electricity in the area and keep Spiderman from sticking to walls. But static electricity can't be the explanation for Spider-Man's powers, because static electricity is an extremely weak force. Besides, he would have to be able to shoot lightning from his fingers. The entry in the Official Handbook of the Marvel Universe states that Spider-Man is able to "enhance the flux of inter-atomic attractive forces on surfaces he touches, increasing the coefficient of friction between that surface and himself." Uh, yeah. That seems to be the best explanation for his power, and the comics have gotten pretty crazy with it. They've had Spider-Man stick with other parts of his body like his back, and villains who tried to pull him off walls ripped pieces of the wall off with him. This is a pretty complicated idea that would explain his ability, but doesn't explain how he got it, since spiders don't stick to walls that way. Let's just go with the obvious. Spiderman sticks to walls with the magical power of unexplained superpowers. Case closed. I certainly couldn't explain it! Thanks for the cut and paste from Wikipedia. I did use that as a reference, and you'll notice I addressed all the problems with that entry - namely that it's more about how he uses his abilities, rather than how they work or how he got them. for him to use—he first uses it in Amazing Fantasy #15 before realizing he has the ability. 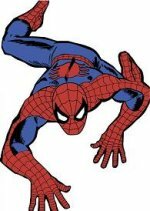 Originally, Spider-Man is able to stick to surfaces using his hands and feet, but later he is shown to be able to cling with his back. use it again, as it was a move born out of anger and desperation. A panel of biologists and physicists on the History Channel’s Spider-Man Tech suggested the barbed-hair on his fingertips (from the movie) could have the same effect as the miniature scopulae hairs on the ends of a spider’s feet. Spiders are able to climb up seemingly impossible surfaces like glass because the scopulae interact with the glass’s atoms causing a form of atomic static cling via the Van der Waals force.The Spider-Man entry in the Official Handbook of the Marvel Universe states that Spider-Man is able to enhance the flux of inter-atomic attractive forces on surfaces he touches, increasing the coefficient of friction between that surface and himself.Bio-electricity. Spider-Girl's similar power is referred to by Reed Richards as "bio-magnetism," but her ability is somewhat different." approximately my trouble. You're wonderful! Thanks , I will try and check back more frequently. How frequently you update your website?